This fall I’m doing a new monthly program called Tween Tuesday, for kids in grades 4-6. My book club flopped last year (it slowly dwindled from six kids to just one kid before I cancelled it), so I was looking to mix things up. Each Tween Tuesday has a book tie-in of some sort, but what the program involves varies from month to month. 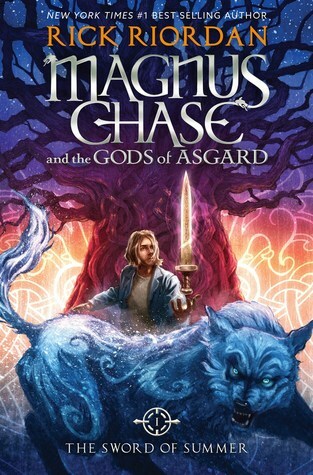 I was pumped to realize my October program would fall on October 6, the same day Rick Riordan’s latest book, The Sword of Summer, from the new Norse-mythology-themed Magnus Chase and the Gods of Asgard series, was released. It was perfect timing to do a Rick Riordan party! I advertised that we’d talk all things Percy Jackson, Greek mythology and Norse mythology. 13 kids came and it. was. awesome. Seriously, the best/most fun program I’ve done in a long while. Everyone there was a huge fan so we geeked out over everything. And I am in huge debt to the awesome librarians who’ve blogged previously about similar parties, because I stole all the ideas for this program from them (mostly from this post about a Heroes of Olympus party on Intentional Storytime, a new-to-me blog that I now adore). Next, I booktalked the book. Our library copies had arrived almost a week early, so while we (of course) didn’t circulate them before the release date, I took one home and read it to prep for the program. (Is this shady? I don’t know.) Anyway, I was glad I did, because I really liked it and my enthusiasm carried over into the program, and I knew what to focus on in the program. Also! The book is set in Boston and I work just outside Boston, so I was able to tell the kids about different local things that they’re familiar with that are mentioned in the book. I asked if they wanted to hear an excerpt (I had picked out a few pages) but they unanimously agreed they’d rather be surprised when they read the book. Next we did the Heroes of Olympus Quest from Intentional Storytime. I basically did it verbatim, although I tweaked it based on what props I could easily round up. I divided the kids into two teams and the kids took turns selecting one item from a table (like a water bottle, a sleeping bag, a guide to edible plants, etc.). Then I read the script out loud and kids got points for their team based on the items they selected. For example, when “you’re running low on fresh water,” the team with the water bottle got five points. They were so excited they were out of their seats shouting and talking–there was great energy and they were having an awesome time. I loved that they’d try to talk me into giving points for things that weren’t obvious (“We could make a water cup out of aluminum foil!”)–there was fabulous creativity and teamwork and I liberally gave out points when they made a good argument. We ended with two simultaneous activities. Most of them did a Greek and Roman god quiz (from… Intentional Storytime!) and we went over the answers right before they left. I also gave them materials to make Norse runestones. Norse runes are important in the book, so I printed out copies of the Norse alphabet and talked a bit about how it worked (each symbol has a letter sound as well as a meaning). Then I let them loose with Crayola air-dry clay to spell out their names in runes or do whatever their hearts desired, like having clay sword battles. I had leather cord available for anyone who wanted to make a necklace or bracelet (although you have to let the clay dry first). The final verdict is that everyone seemed to have a really fun time. I heard several of the kids describing the quest to their parents as they walked out the door, and three of the kids lingered over the clay until I had to boot them from the room 1 1/2 hours after the program began. I would recommend this as a pretty easy, fun program to do with tweens! *Also, there was a girl at the program who had been to a Rick Riordan appearance the night before, and she also told us all about it, showed her signed copy of The Sword of Summer, AND told us about the next Riordan series, coming out in the spring, which was brand-new breaking news that day. So that gave extra coolness points to the program. Sounds like a fun time! I did a Percy Jackson program a few years ago and we had a blast as well. I can’t believe I had never done one before! I already want to do another.